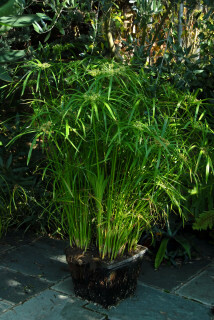 Cyperus alternifolius is an attractive plant for the water garden. It can be planted directly in the pond, used in swamp pots or the bog garden. The requirements for this plant are straight forward - Sun and water. C.alternifolius will grow in a partial shade situation but will not reach the same proportions of a plant grown in full sun. When planting up a swamp pot (any waterproof container) use a loam based compost such as John Innes No2. For pond baskets use a 50:50 mix of peat : grit sand. Some literature suggests that this plant is hardy to Zone 8 (-12ºC) so long as the crown remains under water. Plants grown in this garden have never survived the winter when left in the pond. 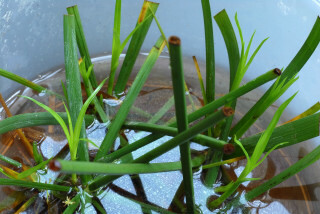 Plants grown in swamp pots have shown only sporadic survival, i.e. the odd stem has pulled through but never enough to prevent you from having to replant the container. 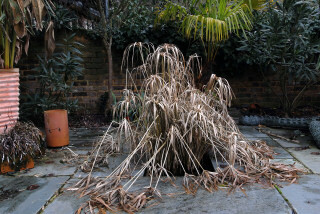 It should be assumed that Cyperus alternifolius will not survive a typical northern-temperate winter if left outside. Bring the plants into a frost free environment for the winter. 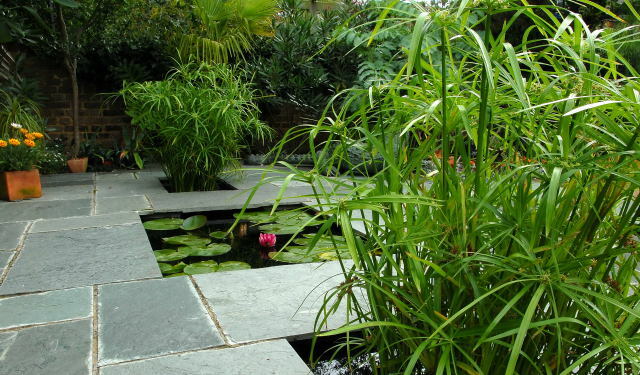 This is fine if you have grown your plants in pond baskets that can easily be lifted out of the water. The main advantage of this method is that you will start the next season with larger plants and therefore can expect to end the season with plants more impressive than those grown from seeds or cuttings. For plants growing in swamp pots, this is largely impractical. The pots will likely be very heavy and take up a disproportionate amount of space in the greenhouse. 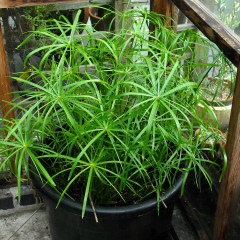 The spread of this plant is such that you are unlikely to be able to contain more than a couple of seasons growth within a managable sized planting basket. At this stage division can easily be achieved using an old saw. Remove the plant from the basket and saw into portions. If the basket is a bit tatty it may be easier to simply cut through the basket than try to remove the plant. Collect seed and sow in the spring. Although seed is produced in abundance, plants grown from seed will not have much stature until quite late in the season. 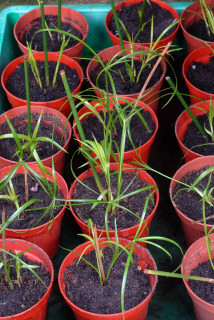 Grow plants from seed mainly to get an inital stock of plants then propagate using cuttings or division. Taking cuttings is by far the simplest option. Many plants can easily be produced in a space saving manner. 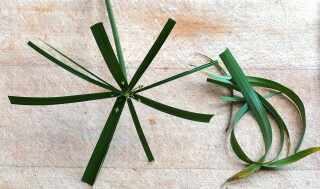 Propagating Cyperus alternifolius from cuttings is very,very easy. First of all cut off the top of a healthy stalk leaving about 4 inches (10cms) of stem. Remove the seed heads (optional) and trim the leaves slightly. 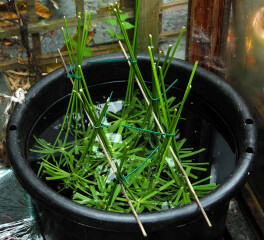 Place the cuttings up side down in a plastic container. (Sawn off water bottles make ideal containers for window sill cultivation). 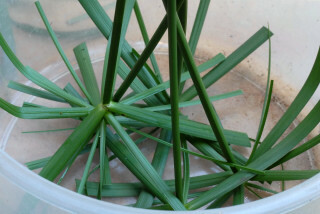 Add water until the stems are 2 inches (5 cms.) or so underwater. Cuttings taken in the Autumn benefit from a spell in a heated propagator or placing the container on a heat mat. This is not essential but will speed up matters. At this stage the cuttings are ready to be potted up. The cuttings are potted up in a loam based compost. Once again you can speed things up placing them in a heated propagator with added water. This picture shows the tall, rather wispy growth the plant achieved during the winter and the nice strong new growth developing at the base. You can follow the planting out process here. 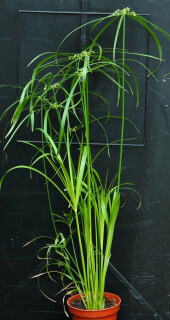 When the plants go out in to the garden, the tall weaker stems tend to snap in the first gust of wind. 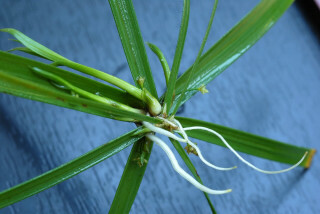 These weaker stems can be removed and yet more plants can be produced as in the case shown below. Now that the greenhouse had been emptied, a larger container could be used. A couple of fish were added for mosquito control.